Frances de la Tour (born 30 July 1944) is an English actress perhaps best known for her role as Miss Ruth Jones in the British sitcom Rising Damp, and as Madame Olympe Maxime in the film adaptation of Harry Potter and the Goblet of Fire. De la Tour was born in Bovingdon, Hertfordshire, to Moyra (née Fessas) and Charles de la Tour. She was educated at London's Lycée Français and the Drama Centre London, (a college of the University of the Arts London). She is the sister of Andy de la Tour, and was briefly married to playwright Tom Kempinski. She has a son and a daughter. On leaving drama school she joined the Royal Shakespeare Company (RSC) in 1965 where she studied with Michel Saint-Denis. Over the next six years, she played many small roles with the RSC in a variety of plays, gradually building up to larger parts such as Hoyden in The Relapse and culminating in Peter Brook's acclaimed production of A Midsummer Night's Dream in which she played Helena as a comic "tour de force". In the 1970s, she worked steadily both on the stage and on television. Some of her notable appearances were Rosalind in As You Like It at the Oxford Playhouse in 1975, Isabella in The White Devil at the Old Vic in 1976. She enjoyed a collaboration with Stepney's Half Moon Theatre, appearing in the London première of Dario Fo's We Can't Pay? We Won't Pay (1978), Eleanor Marx's Landscape of Exile (1979), and in the title role of Hamlet (1980). In 1980, she played Stephanie, the violinist with MS in Duet for One, a play written for her by Kempinski, for which she won the Olivier for Best Actress. 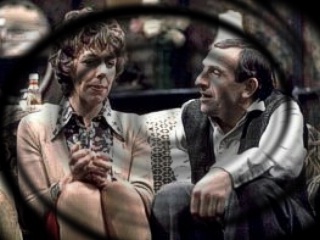 She played Sonya in Uncle Vanya opposite Donald Sinden at the Theatre Royal Haymarket in 1982. Her performance as Josie in Eugene O'Neill's A Moon for the Misbegotten won her another Olivier for Best Actress in 1983. She joined the National Theatre for the title role in Saint Joan in 1984 and appeared there in Brighton Beach Memoirs in 1986. She again won the Olivier for Best Supporting Actress for Martin Sherman's play about Isadora Duncan, When She Danced with Vanessa Redgrave at the Globe (now the Gielgud) Theatre in 1991, Leo in Les parents terribles at the National in 1994.